Google today announced that Cloud Firestore, its serverless NoSQL document database for mobile, web and IoT apps, is now generally available. In addition, Google is also introducing a few new features and bringing the service to ten new regions. 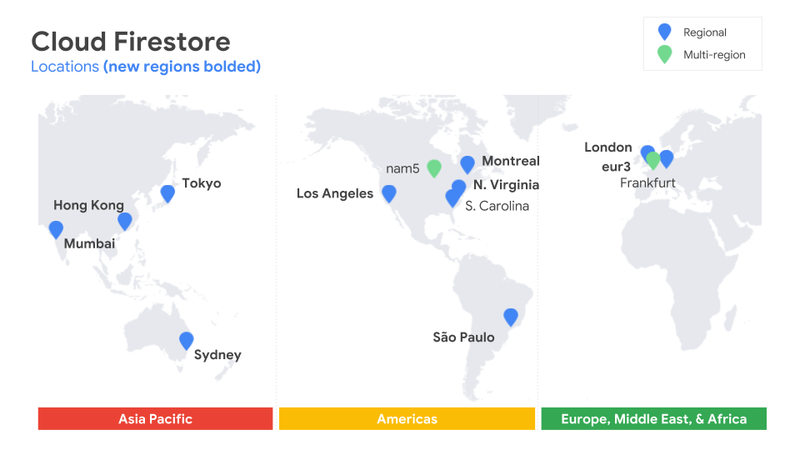 With this launch, Google is giving developers the option to run their databases in a single region. During the beta, developers had to use multi-region instances and while that obviously has some advantages with regard to resilience, it’s also more expensive and not every app needs to run in multiple regions. And talking about regions, Cloud Firestore is now available in ten new regions around the world. Firestore launched with a single location when it launched and added two more during the beta. With this, Firestore is now available in 13 locations (including the North America and Europe multi-region offerings). McGrath tells me Google is still in the planning phase for deciding the next phase of locations but he stressed that the current set provides pretty good coverage across the globe. Also new in this release is deeper integration with Stackdriver, the Google Cloud monitoring service, which can now monitor read, write and delete operations in near-real time. McGrath also noted that Google plans to add the ability to query documents across collections and to increment database values without needing a transaction soon. It’s worth noting that while Cloud Firestore falls under the Googe Firebase brand, which typically focuses on mobile developers, Firestore offers all of the usual client-side libraries for Compute Engine or Kubernetes Engine applications, too. One of the advantages of Firestore is that it has extensive offline support, which makes it ideal for mobile developers but also IoT solutions. Maybe it’s no surprise then that Google is positioning it as a tool for both Google Cloud and Firebase users.